Nicastro recorded hundreds of meows made in real-life situations between cats and their owners. Then he had unfamiliar listeners (some who had cats and others who didn’t) listen to the recordings. "In one experiment, I asked them to classify the context to when the meow was produced. For instance, is this a food call or is this a ‘get away from me’ call? In the second experiment I asked them more general questions. Does this call sound pleasant? Does this call sound urgent or demanding?" Nicastro explained. It turns out that cat owners were pretty good at understanding what the cats were trying to communicate with their meows. "People who had no experience with cats did poorly. People who had some experience with cats, owned cats, or had lived with them did significantly better," said Nicastro. The cat owners were able to correctly interpret 40 percent of the meows; twice as many as those who did not have cats. However, humans’ ability to interpret communication from another human speaking the same language is between 95 percent and 98 percent, so we have a long way to go before people are fluent in "Cat Speak." What do these meows mean? Nicastro found there are different types of meows people can identify, and they have different general meanings. 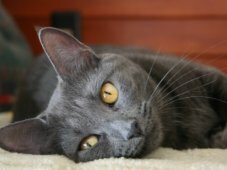 "What I found was there are certain acoustical qualities that correlate with something sounding pleasant or sounding urgent, and I speculate that the cats can use these acoustical changes to manage our impressions of how their meows sound to get what they want out of their human caretakers," said Nicastro. Urgent calls sound unpleasant, demanding attention. Calls that sound pleasant don’t seem urgent. "Angry or antagonistic meows tend to be longer in duration and friendly calls tend to be a little shorter, and that correlates with the idea of pleasantness," said Nicastro. In addition, angry or defensive calls have a lower pitch, while friendly calls have a higher pitch. The theory is that lower pitch calls make cats sound bigger and more threatening, while higher pitch calls make them sound small and helpless – which is attractive to humans. Meowing is an attempt by our cats to communicate with us (and only us; they don’t meow to other cats), and it seems that we have the ability to understand what they want – if we’re listening. Jun 29, 2017 admin Comments Off on Can Cats Talk?